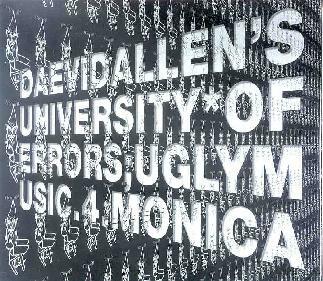 University Of Errors - "Ugly Music For Monica"
I've been a fan of Daevid Allen's music for nearly 30 years, but it wasn't until Gong came through Cleveland in 1999 that I got to see him perform live. I've had the good fortune of seeing him twice since then - once with University Of Errors and once again with Gong - and I have to say that he is responsible for some of the most purely FUN shows I have ever seen. Honestly, in addition to cranking out fantastic and completely cosmic music, the man is an absolute blast in live performance. And this sense of fun is clearly communicated on the new University Of Errors CD, Ugly Music For Monica. The opening track, "Skulls Of Our Enemies", starts off like we're going to be in heavy metal heaven. But it soon launches into a quirky but brain crushing rocker of an instrumental that sets the tone for this crunchy rocking album that includes all the circus-like hallmarks of a Daevid Allen performance. Daevid and Josh Pollack are a guitar duo force to be reckoned with, and along with the rhythm section of Michael Clare on bass and Jason Mills on drums, they crank out blazing rock that is just as head banging as it is thoughtful. "Wage Slave" and "Mystico Fanatico" are equally searing rockers with robotic rhythms and classic Daevid lyrics. "Earthbound" is similar, and one of my favorite tracks, being a rockin Gong and Beefheart blend of heavy, humorous progressive rock. "Rich Men Eat My Voice" is a riotous slab of progressive space punk. "Php 2032" is the 2032 futuristic version of Gong's Pothead Pixies. "Moo?" is a classic Gong styled tune. Ditto for "If You Die", on which we're also treated to some tasty cosmic glissando guitar. Probably the most purely spaced out song of the set. We're also treated to a cover of Kevin Ayers' "Clarence In Wonderland". But my hands down favorite is "So What? ", which begins very much in the Gong mold, and even has a jazzy feel, but a few minutes into the song the bubbling space guitars start to meltdown, and the music dances about as a tripped out, off-kilter, dark and mysterious avant-prog construction. What's really interesting is that the song is credited to Allen and Miles Davis, "So What" being a track from Miles' classic Kind Of Blue album, though this version takes the basic riff and turns it into something totally belonging to University Of Errors. In summary, this is by far the most balls out rockin set the faculty have released yet. Over 30 years after the inception of Gong, Daevid Allen is still rocking out, clowning around, and standing tall as an inspiration to us all. For more information you can visit the University Of Errors web site at: http://www.universityoferrors.com. Ugly Music For Monica is distributed by WEED Records. You can visit their web site at: http://www.WEEDrecords.com.